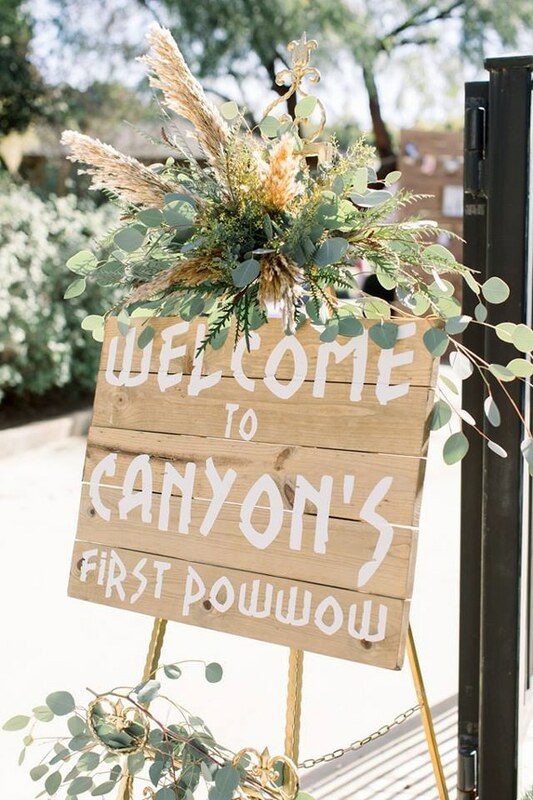 This amazing Pow Wow 1st Birthday Party is everything if you’re looking for a nature-inspired, woodsy feel. We can’t get enough of this gorgeous birthday party set-up! 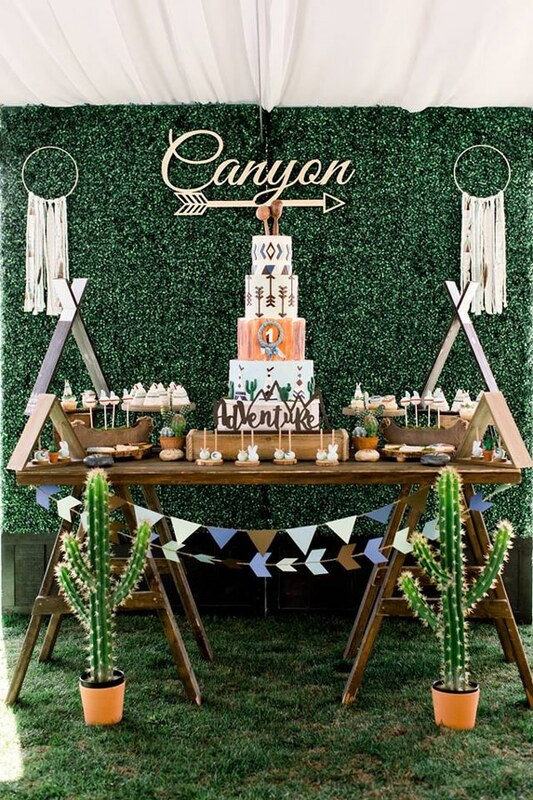 Having a unique first birthday party theme can be such a fun way to establish your own way of doing things and this Pow Wow 1st Birthday Party did not disappoint! 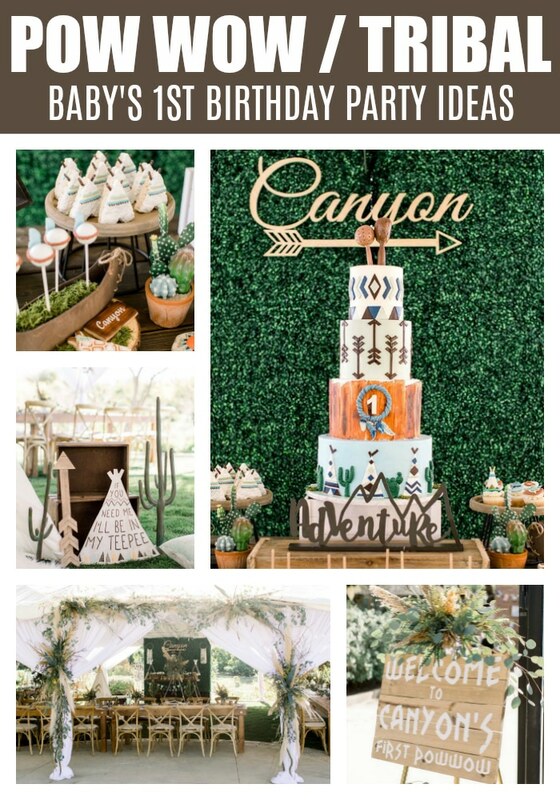 We love the tribal tones, boho vibes and elements of nature that are included in all of the Pow Wow / Tribal birthday party decorations. It truly is a unique way to celebrate the major first birthday milestone. M&J Kreations did an amazing job with the design and style of this Pow Wow 1st Birthday Party. Guests were seated inside of a whimsical tent, where the openings were held back by gorgeous greenery and wildflowers. What a magnificent first impression this evoked from the second the guests walked up to the first birthday! 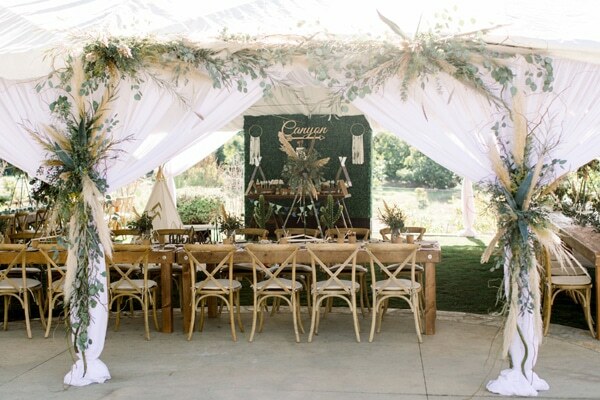 The greenery and nature-inspired florals that were used on the tent ties were incredible. Everything had such an ethereal look and it was hard not to feel a sense of calm and tranquility when stepping foot inside of this magnificent party venue! One thing we love about the birthday party decorations that were used for the Pow Wow 1st Birthday Party is that they could be used for just about any event. 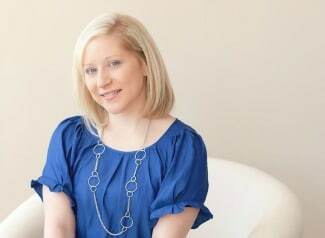 This event really gives inspiration for any upcoming celebration you may be having, from showers, special birthday celebrations, or even weddings! The decorations used for this first birthday were unique but versatile. Everything about the table set-up for the guests is amazing. 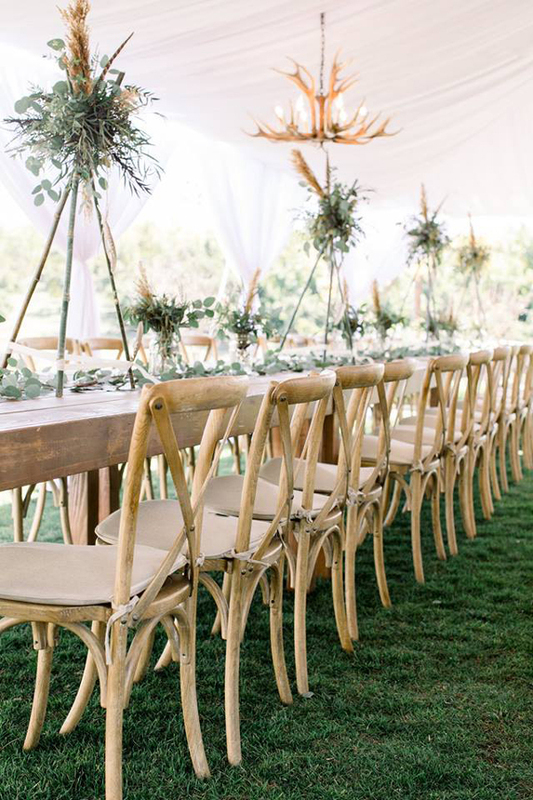 The wooden chairs are a gorgeous change in typical seating that you see at many events. And the centerpieces, along with the greenery used to decorate the dining tables, are out of this world. We love the height that the centerpieces have, which are so eye-catching and magnificent! 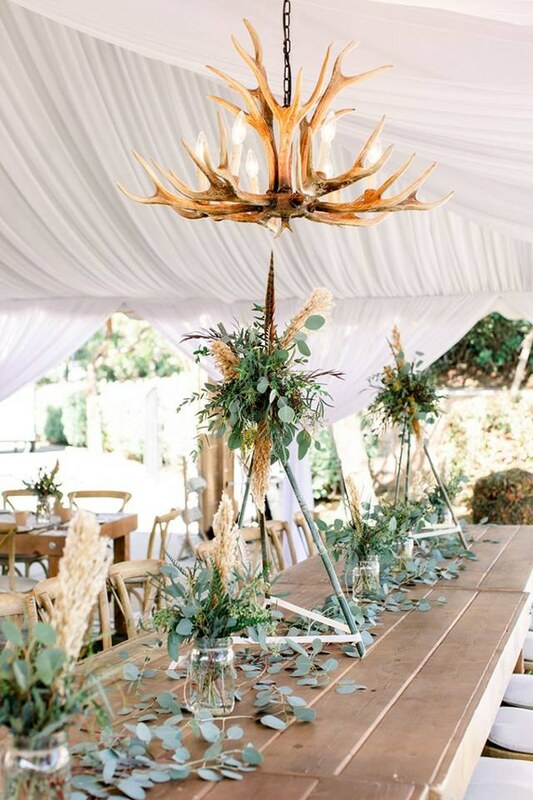 An amazing pow wow birthday decoration that was used was the antler chandeliers that were found in the white tent. 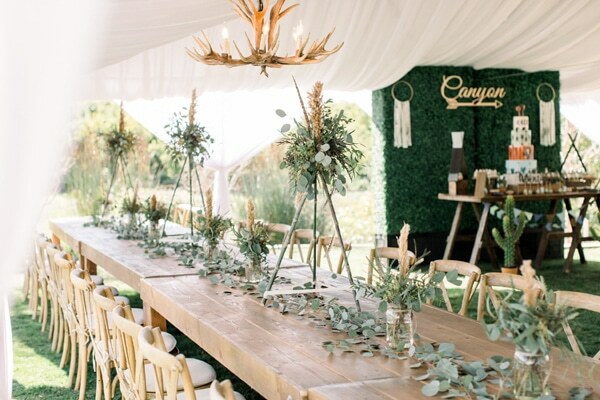 Nature and the woods were a huge part of the decorating inspiration that was used for this birthday party and we absolutely love it. 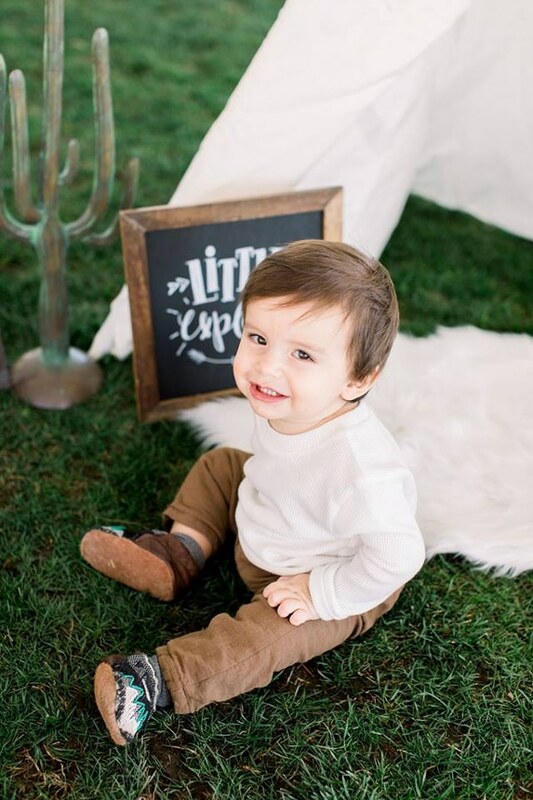 This little guy was getting ready to celebrate his first birthday in style and the wooden signs around the event were a great way to welcome everyone to the event. Just look at this sweet one-year-old! He had special first birthday moccasins to wear, on top of the amazing birthday party that he was able to enjoy, as well. What a handsome little guy who sure knows how to ring in that first big milestone! 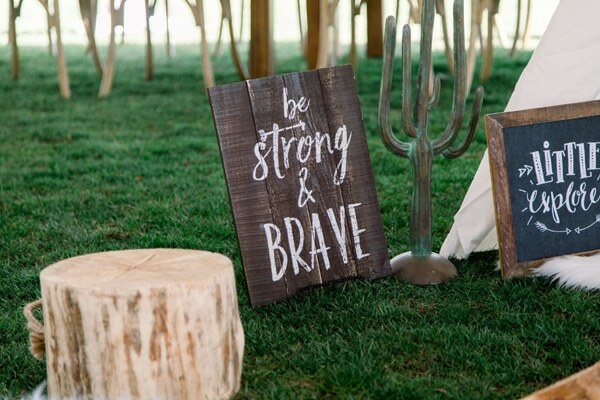 Stylish decorations were used on the guest tables, including these amazing word signs that were placed strategically throughout the event. If a first birthday is anything, it is definitely full of adventure! 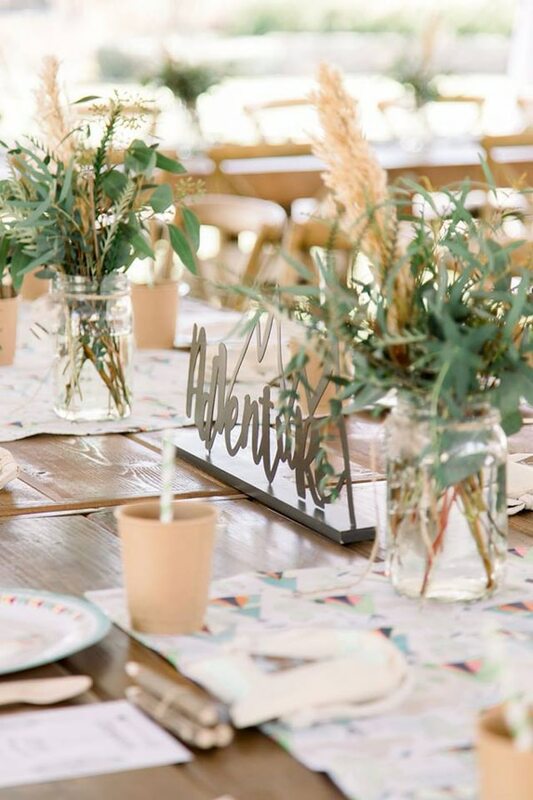 These mason jars full of greenery, along with the twine that was used to spruce up the jars is wonderfully vintage, which again, could be used for any kind of event that you may be having. 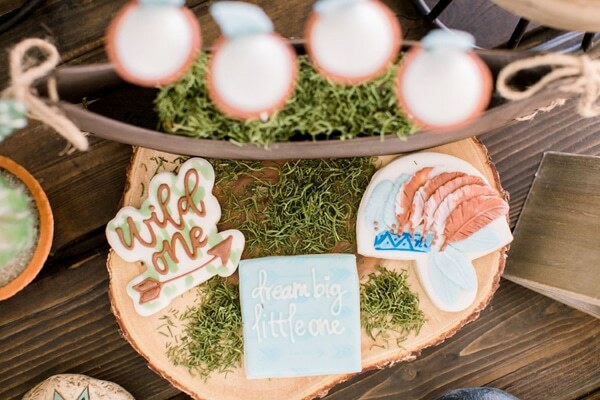 We just love the inspiration that this Pow Wow 1st Birthday Party provides! 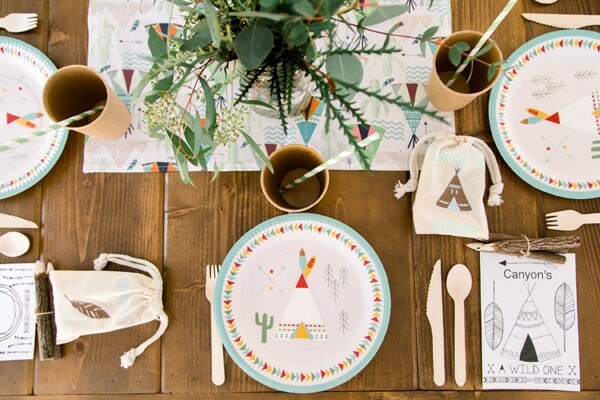 How cute are the teepee plates, coloring pages and table runners that are used on the guest tables?! 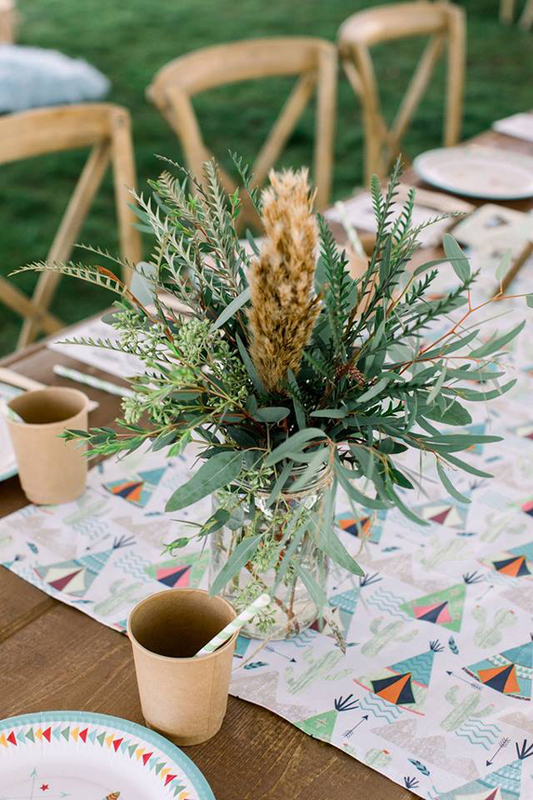 Nothing says authentic Indian Pow Wow Birthday Party more than this place setting and we absolutely adore it! 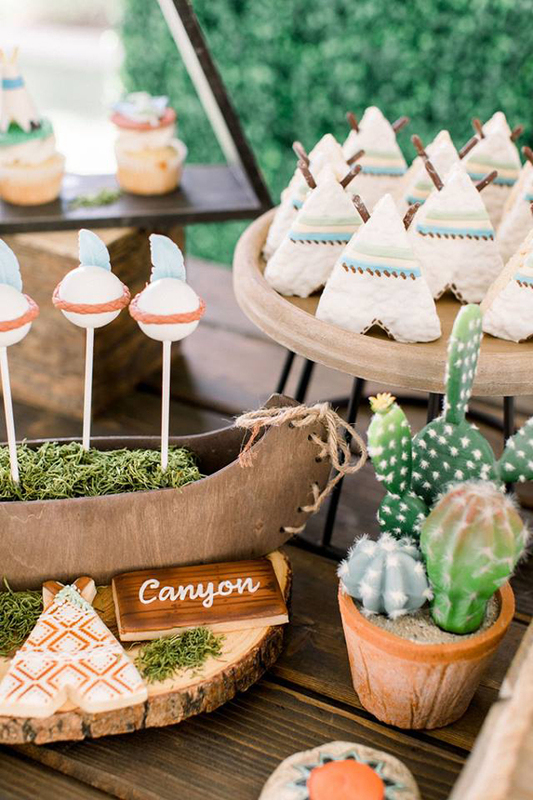 This little guy’s 1st Birthday Pow Wow Dessert Table is the thing that dreams are made of! First of all, we adore the cactus that were found on either side of the table. What a unique and authentic birthday party decoration that went above and beyond! This Pow Wow Birthday Party is simply amazing! The amazing tribal cake was created by Grace & Honey Cakes and there was nothing forgotten. It is truly a piece of art that was almost too beautiful to cut up and serve! 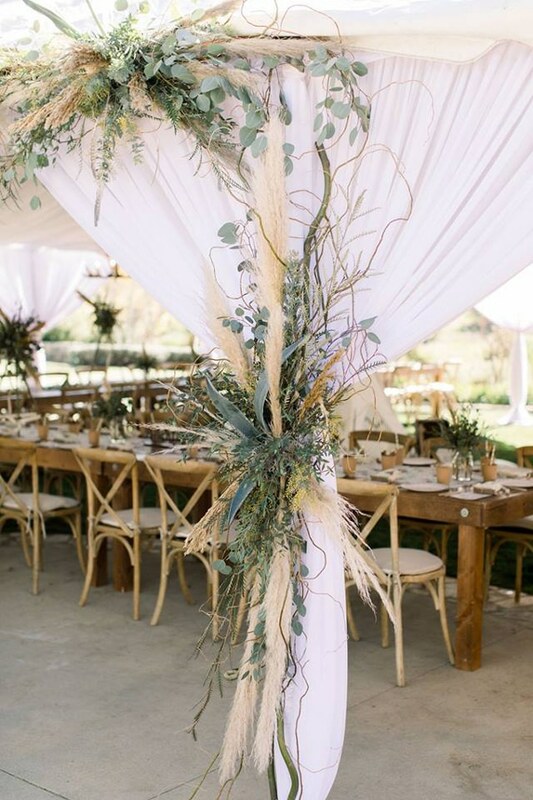 We love the wooden and rustic elements that were added with the cake stand, along with the gorgeous faux grass backdrop that was used. More wooden items were used to help decorate this gorgeous Pow Wow 1st Birthday Party. How cute are the small wooden coasters that were available to hold the cake pops?! What a fun and unique serving idea! The details that were found on this Pow Wow 1st Birthday cake were truly amazing. 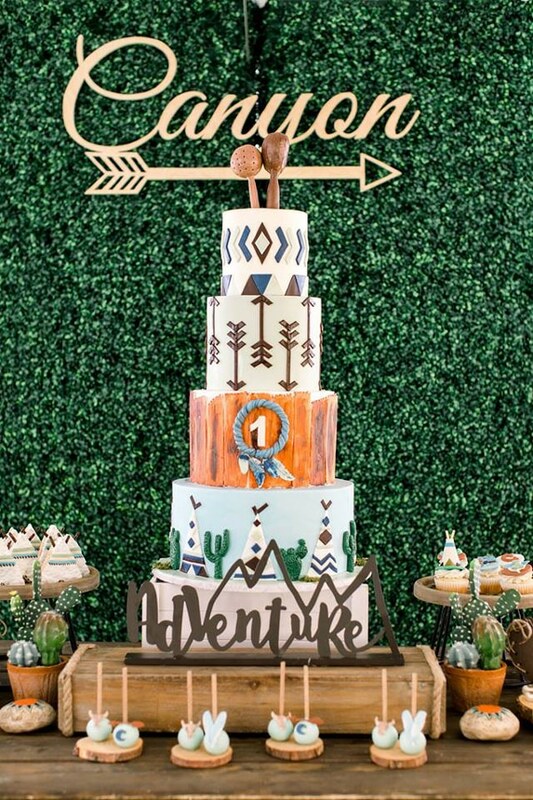 The teepees, cactus, tribal arrows, and colors were absolutely out of this world. We can only imagine the time and effort it took to create such a beautiful creation! 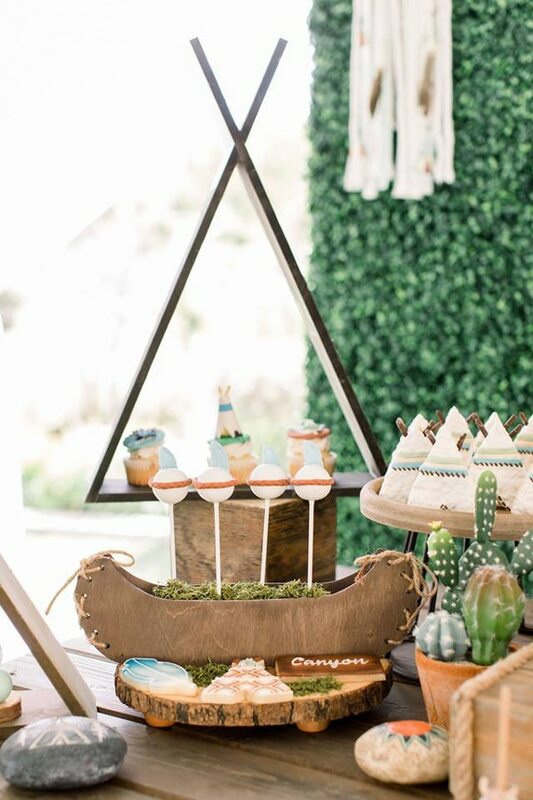 Another great serving idea was found in this cute canoe that was filled with moss, where more cake pops were able to be displayed. The dessert table was just incredible with mind-blowing presentation of every single piece of dessert! There can’t be a 1st birthday party without birthday cookies! This little guy was able to enjoy many different types of sugar cookies that were decorated perfectly. He is one lucky “Wild One”! All of the desserts were provided by Sweets By Gigi, who did an incredible job living up to the amazing Pow Wow Birthday Theme. Everything looked absolutely amazing and fit into the decor of the event perfectly. These cupcakes! 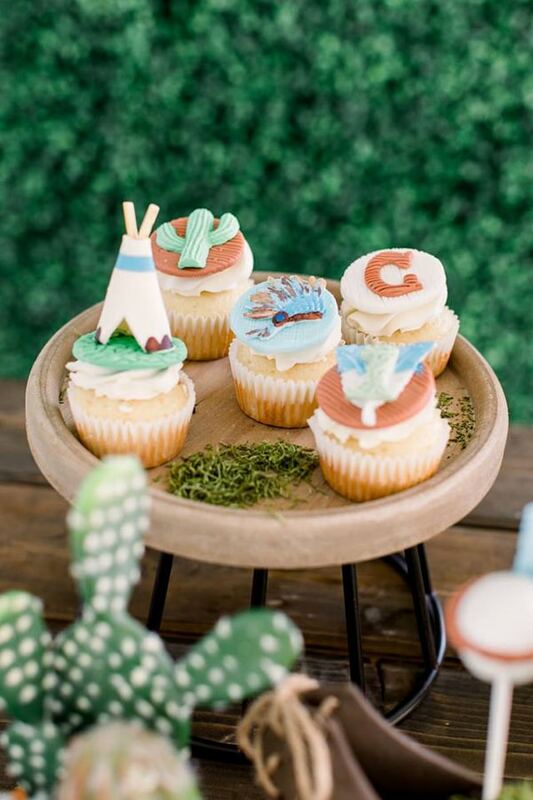 They had amazing cupcake toppers on top of the delicious buttercream frosting, that provided the perfect decor for a Pow Wow Birthday Party. 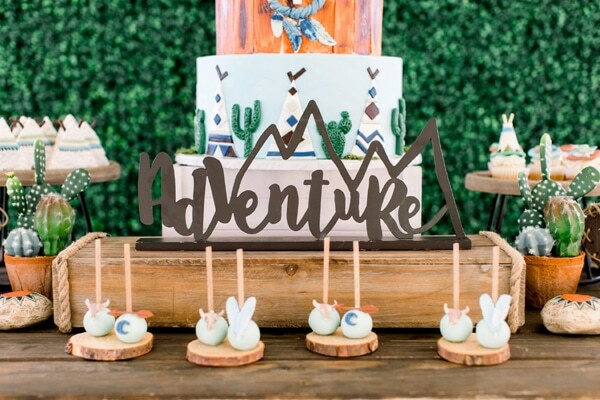 We love the wooden effects found around the dessert table, along with the moss that was effortlessly placed at different spots on the table and serving trays. 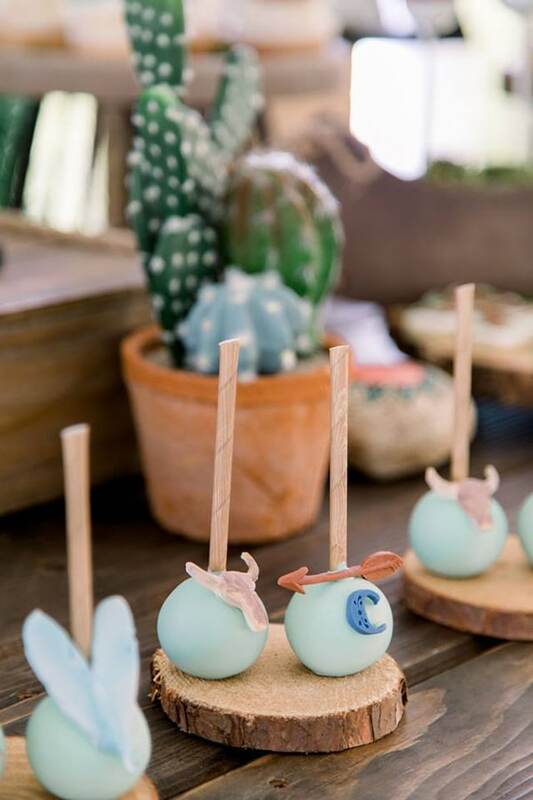 Even the cake pop sticks were the perfect addition to the outdoor, rustic theme! The Rice Krispie teepees may be one of our favorite food items from the Pow Wow 1st Birthday Party! They all were perfectly created, with cute little pretzels added for the effect of the wooden poles used to keep the teepee standing tall. Amazing! 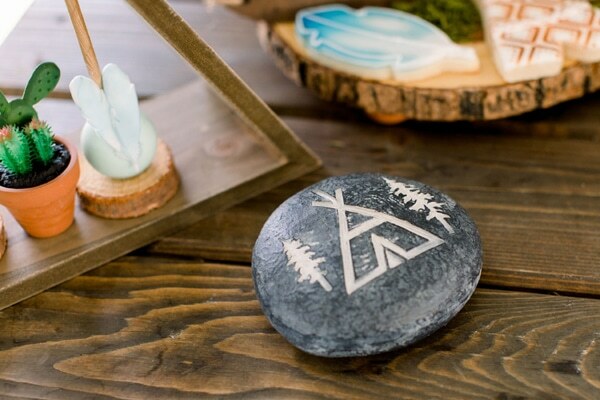 Even fun, tribal rocks were found scattered throughout the event to add to the pow wow vibe of the day! How could a Pow Wow 1st Birthday Party not include a teepee for the birthday boy?! 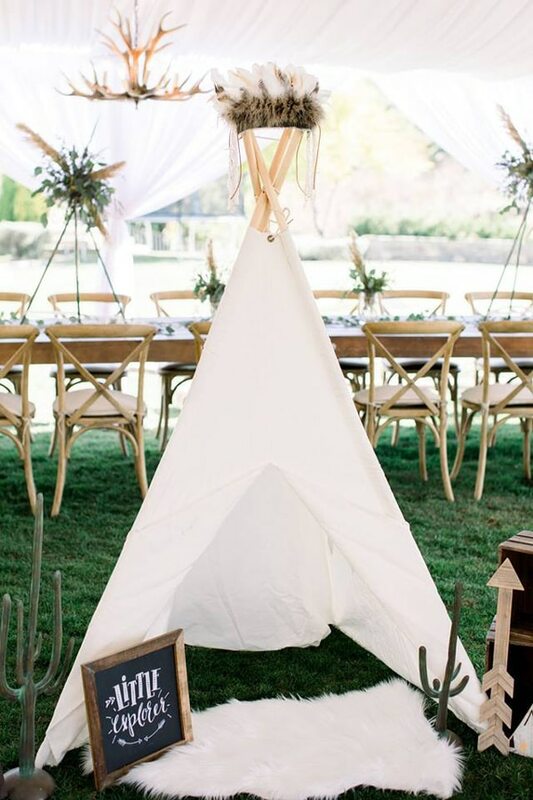 We love the set-up of this 1st birthday teepee, complete with a chalkboard sign and inviting fur rug for everyone to get comfy with. So cute! 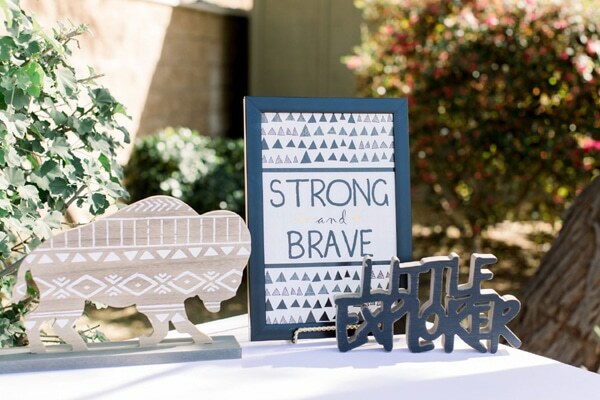 Wooden signs, along with chalkboard signs were displayed and they were perfect pow wow birthday party decorations! 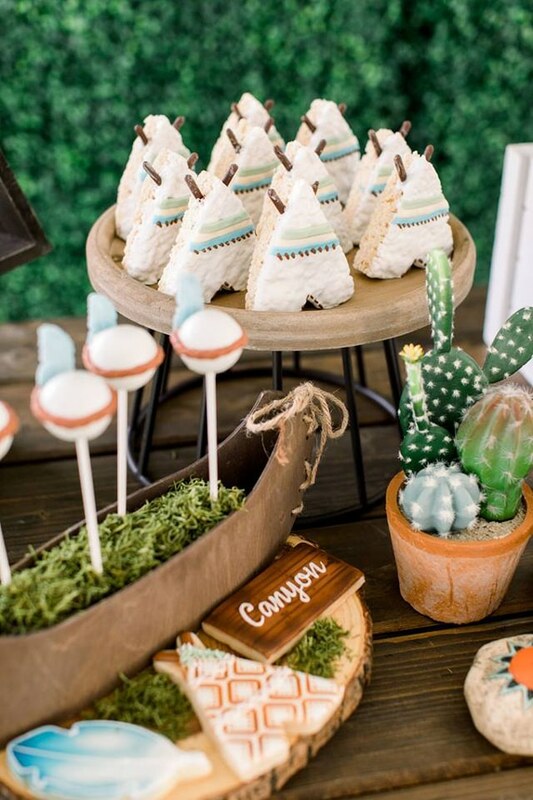 They provided the perfect rustic vibe to the event, while reminding everyone what type of little guy they were celebrating! 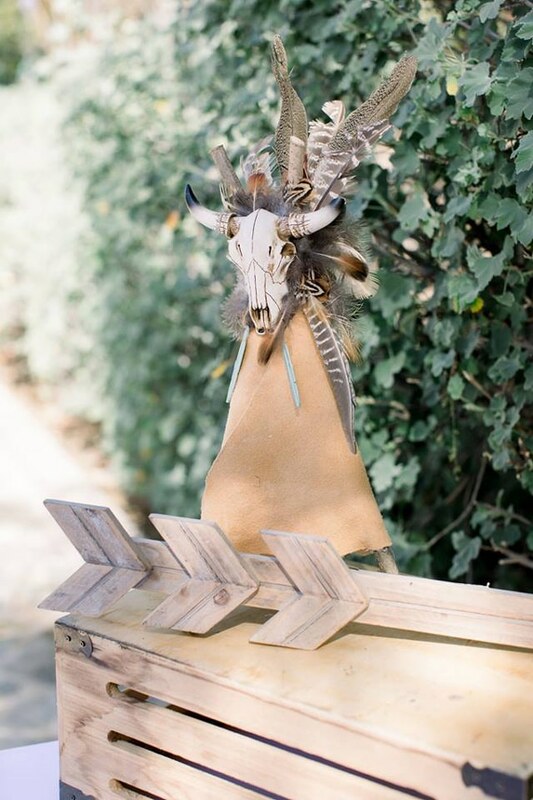 Incredible wooden art was created and displayed throughout the Pow Wow 1st Birthday Party and we absolutely love it! Nature was a huge part of this event and it’s clear that it’s a huge part of this little guy’s life, as well. We’re positive this little guy is going to have some amazing artwork to hang up in his room after his big milestone birthday celebration! This Pow Wow Theme makes a great nursery theme too! 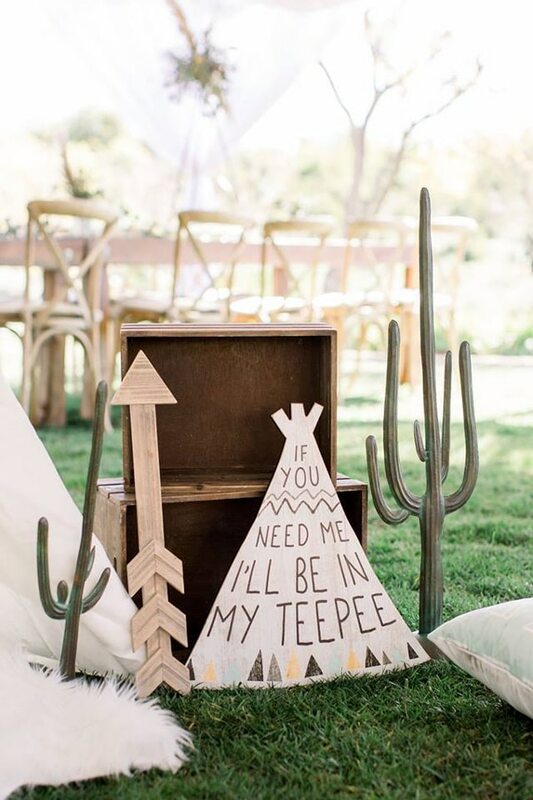 It doesn’t get more tribal than including wooden arrows and cow skulls on miniature teepees around the event! What an authentic decoration that fit the theme wonderfully! 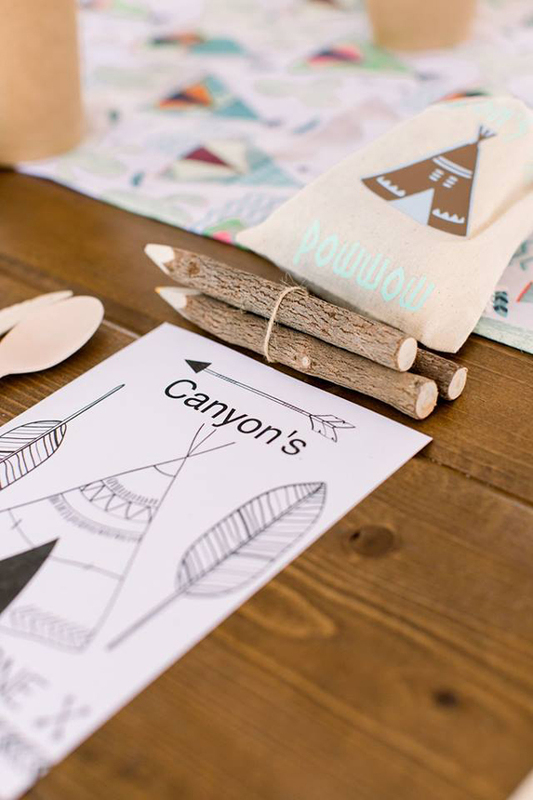 The coloring sheets with wooden crayons were a great way to give back to all of the little guests who attended the party and were a perfect idea for this Pow Wow 1st Birthday Party gift bag! Complete with it’s own little canvas pouch, it epitomized the theme of the event and will be one that all of the guests will remember for quite awhile! Happy birthday little guy! 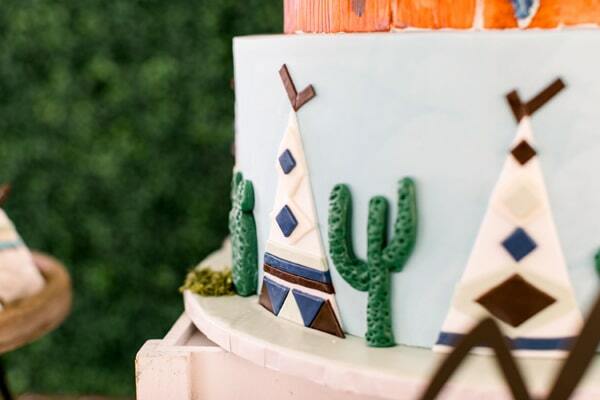 What are your favorite details in this Pow Wow 1st Birthday Party? Let us know in the comments below.